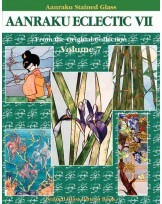 Aanraku Stained Glass Pattern books are filled with unique and hard to find patterns. Many are submitted by artists from all over the world. 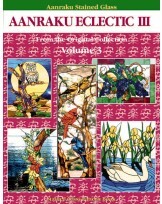 A unique collection of 32 designs by the students of the Aanraku Stained Glass Studio. All designs are shown in color with line drawings. Patterns include flowers, birds, animals, seascapes, fish, and more. 8 pages of full color photos. Piece count and enlarging instructions included. 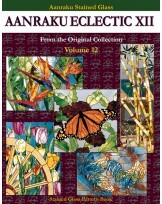 A unique collection of 26 designs by the students of the Aanraku Stained Glass Studio. All designs are shown in color with line drawings. Patterns include Golden Gate Bridge, Librarium, Rhododendrons, Grape Cabinet Doors,Nautilus, Maine Lighthouse, and more. 8 pages of full color photos. Piece count and enlarging instructions included. 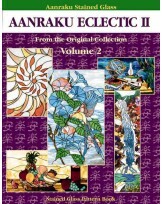 A unique collection of 28 designs by the students of the Aanraku Stained Glass Studio. All designs are shown in color with line drawings. Patterns include patterns for birds, fish, floral motifs, animals, sidelights, Tiffany style designs, waterfalls, and cultural patterns. 8 pages of full color photos. Piece count and enlarging instructions included. 26 simple and complex, delightful and diverse patters containing designs of patriotic themes, historical scenes and beautiful nature inspired landscapes. 8 pages of full color photos. 26 designs with a new attitude. Patterns include Oriental scenes, children's book cover illustrations, nature and 16th century kimono patterns designs. 8 pages of full color photos. Piece count and enlarging instructions included. 26 exquisite new designs featuring dolphins, peaceful gardens, themed landscapes, red barn, grapes and wine, fish, flowers, Itza pyramid, a tiger and a geisha to name just a few of the patterns. 8 pages of full color photos. 26 exquisite designs featuring flowers, outdoor scenes, butterflies, birds, fish, a raccoon, and more. 8 pages of full color photos. 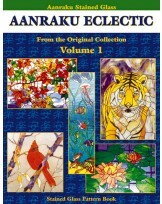 A unique collection of 26 designs by the students of the Aanraku Stained Glass Studio. All designs are shown in color with line drawings. Patterns include flowers, koi, butterflies, herons, fish, water gardens, hot air balloons, and more. 8 pages of full color photos. Piece count and enlarging instructions included. 26 patterns which include the Golden Gate Bridge, Spanish buildings, Morning Glories, leaping dolphins, Betta fish, Posiden, hummingbirds, butterflies, a dragon, a unicorn, Japanese Samurai, a 4 panel garden window, and various flowers are part of this latest collection of patterns. 26 exquisite new designs featuring Japanese themed landscapes and Samurai warriors, vineyards, flower gardens and soaring eagles to name just a few of the patterns. 8 pages of full color photos. 26 exquisite designs featuring boats, fish, a jungle scene, a mermaid, flowers and more. 8 pages of full color photos. 27 exquisite designs featuring landscapes, florals, butterflies, mountains, plants, and horses to name just a few of the patterns. 8 pages of full color photos. 26 exquisite designs featuring tropical plants, giraffe, windmill, cat, sea turtle, fish bowl, and more. 8 pages of full color photos. Contains 50 simple, repeatable quilt designs for panels and suncatchers such as the double wedding ring and house design. Some designs are full-size while others need to be enlarged. 32 pages in all. 8 pages in full color. Contains 51 more traditional quilt designs with appliqué. Moving up one level in design and ability. Traditional designs mixed with nature and holiday themes. 8 pages of full color photos. 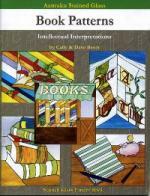 Features 26 pattern for book lovers and the intellectual interpretations of the joys of reading. Designs include images of cookbooks, fairytale books, bookshelves, accountant ledger and more. Color photos included. Aanraku's collection of Little Sweeties to brighten your day. 26 sweet little fairies in different poses and settings: under a leaf with a raindrop, in a flower center, with a crayon, in a cup of coffee and more. Color photos of completed patterns included. Inspired by original Japanese crests and modified for stained glass. These geometric and symmetrical designs will remind you of what you see when you look though a kaleidoscope. You can make these designs in a variety of color combinations. 32 pages, 25 patterns. 12 3-D and whimsical picture holders. Templates of a lighthouse to a garden gate, to a trellis with ivy. 11 patterns in all. Now you can wear your stained glass creations. A complied selection of some simple, and some challenging designs for attractive stained glass belt buckles that are easy and fun to make. Contains 22 patterns to create 3 or 4-sided Oriental table lamps. Detailed instructions and diagrams included to use one or 2 panels to make a candle holder. Designs include bamboo, Art Deco fish, Japanese doll, tropical bird and more. Wiring and assembly instructions included. Full color photos. Contains 24 patterns ranging from patriotic to nature and cute everyday items including the American eagle and flag, orca whales, cats, sushi, flowers, and art deco themes. 8 full color pages with detailed assembly instructions. 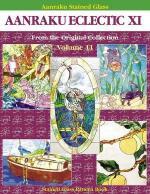 Contains 24 patterns ranging from fish to flowers, holiday icons, and lighthouses to name a few. 8 pages of full color show off these beautiful lanterns. Detailed assembly instructions included.